Wrestling: Big men in tights and boots, pretending to kick the crap out of each other. Hear them roar in pain as a boot glances off their shoulder with a feather-light touch. See them glisten with sweat as they run from rope to rope, seemingly unable to stop running because they were Irish-whipped. See them land atop their opponent with what would be a devastating splash, if it wasn’t for the fact that they landed on their knees and arms first. Watch them fight in a pre-scripted battle of might and will. I like Wrestling. Don’t get me wrong. It’s funny to watch, and for the most part is well delivered. Without the knowledge of the ring and the techniques used, you could be forgiven for thinking it’s real sometimes. Who can forget trying a Figure-4 Leg-Lock out and discovering it really does bloody hurt? It’s known these days as “Sports Entertainment”, and is more about technique these days than the in-ring personas that it always used to be. Back in the days when the Undertaker was thought of as something invincible and Hulk Hogan was the Real American, wrestling was as much about ego and popularity. 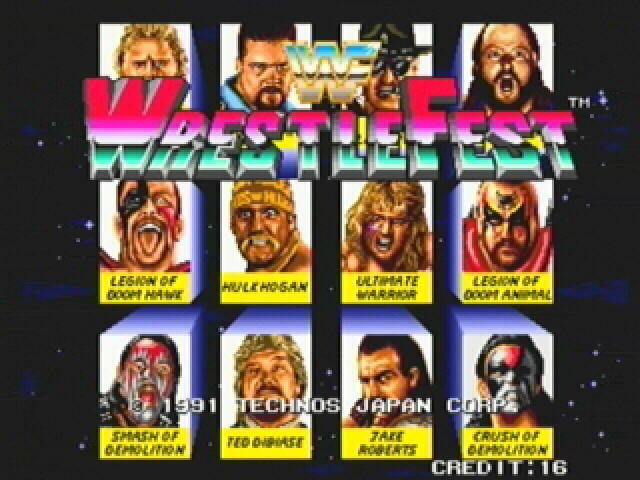 It was the meteoric rise in popularity of WWF (now known as WWE thanks to the other WWF… confused? 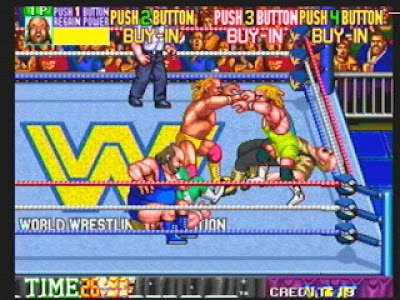 You will be) that prompted a stream of computer and arcade games dedicated to Wrestling, licensing the big names of the era. 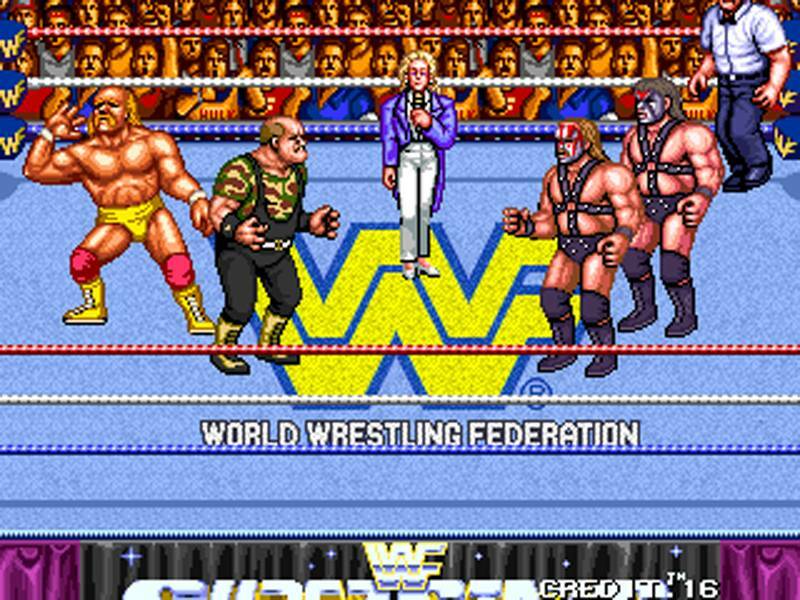 There had been a game already in the arcades, WWF Superstars, but when this one came out, it was enormously popular. And deservedly so, because it’s one of the best Wrestling games of all time. First off, I must point out that there’s ALWAYS the fundamental differences between Wrestling, REAL Wrestling (the ACTUAL sport) and Wrestling Video games. Real Wrestling is an Olympic sport, is very technical, and relies on real pain thresholds and endurance to determine a winner. However, it is devoid of storylines, egos, flashing lights and Pyrovogues. The more popular form of Wrestling, sometimes known as American Wrestling, is what you see on WWE/TNA etc. The moves aren’t meant to cause lasting pain or damage, everything’s scripted and pre-determined, and you can’t place any reliance on how things turn out being down to an individual’s skill. Look at Mr Script-writer in the office instead. However, it’s a spectacle of showmanship, and as such fantastically popular. 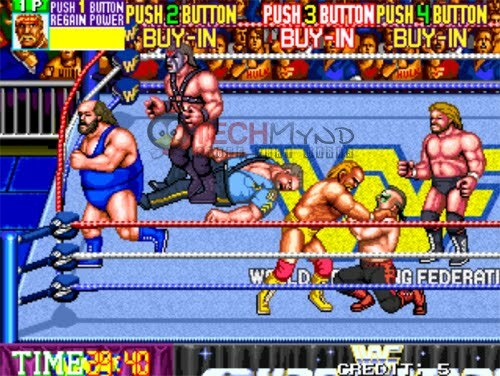 Video Games of Wrestling always take the best of both. 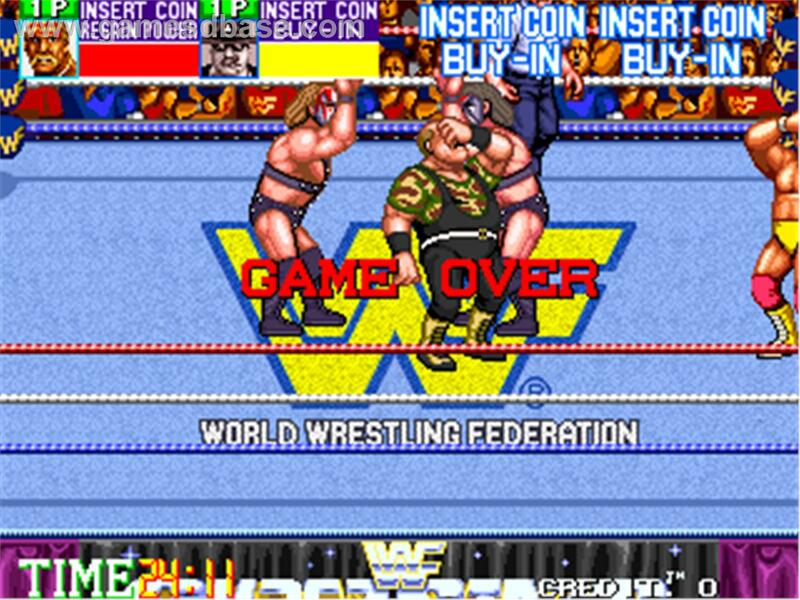 Imagine combining the finesse and showmanship from American Wrestling with the reality of Real Wrestling… well, that’s what the Video Games always assume. Wrestling’s real, and all moves hurt and drain yours or your opponent’s vitality until one is so hurt/tired they can’t kick out of a pin by a 3 count, or are forced to submit to pain in some sort of hold. Hold on, hold on… I’ve not explained this very well. All that is if you assume a standard match, of course. 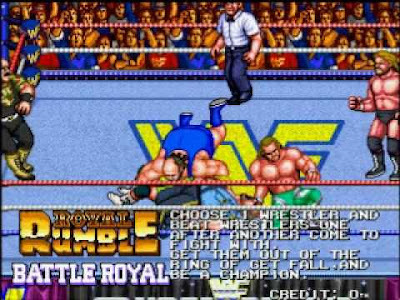 The game in question offers you a choice to begin with… Saturday Night’s Main Event, or the Royal Rumble. 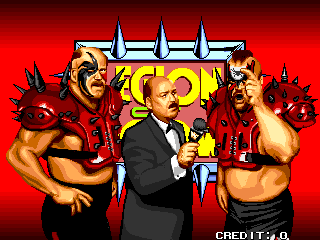 Simple concept, take your tag team through 3 or 4 matches to win yourself a chance to take on the WWF Tag Team Champions, The Legion Of Doom… one of whom is also dead IRL now. 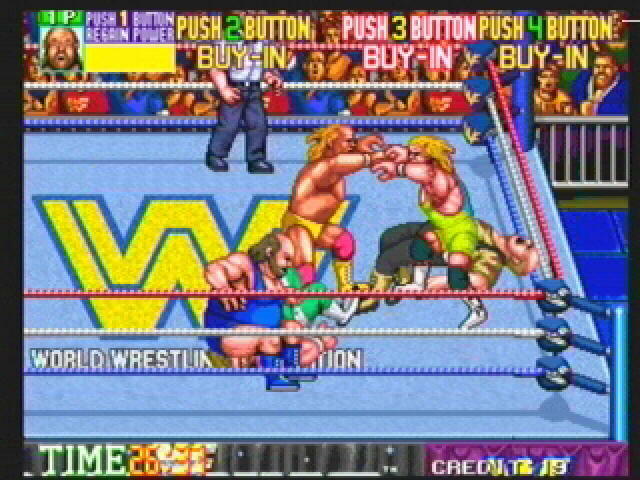 Working as a tag team, only one of each team is allowed in the ring, however the other wrestlers may interject if a pin is made. With high energy levels, the chances of a wrestler kicking out of the pin is very high, however as energy levels deplete, the pinned wrestler may have to rely on his partner making the save before the 3 count. Alternatively, if energy levels are low and a submission hold is applied, there’s very little chance of avoiding defeat. 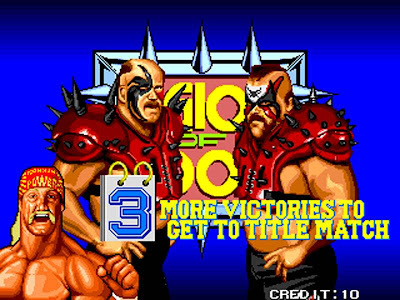 After a few successful victories, you then have to face Hawk and Animal, the Legion of Doom (or Road Warriors if you’re a purist) for the title, and believe me, their energy meters and regularity at winning the grapples make life very very difficult. The grapples… of course… I should tell you the physics of the game… well, to be honest, they’re fairly random. You can punch and kick, however if you and your opponent get close enough, you’ll engage in a grapple. Button bashing will usually win this, bashing the kick button will normally result in an Irish Whip, bashing the punch button will perform a seemingly random move from the wrestler’s repertoire. For example, you might perform a body slam, or a backbreaker, or, if the opponent’s energy is getting low, you may perform your signature move, although some wrestler’s moves are performed on downed opponents only, for example Hulk Hogan’s leg drop or Earthquake’s sit-splash. Others you may even need to make your opponent run to the rope (Big Boss Slam, for instance). You can always tell when your opponent’s ripe for a pin, they lie diagonally on the floor instead of horizontally. You will too, once your energy’s low enough. Keeping your partner on the side out of the ring for a certain length of time will cause him to “Power up” and get all anxious to get involved, like, giving a boost of energy too. Another nice feature is that your wrestlers can “team up” at the tag, resulting in a nice easy way of keeping your opponent in your corner and draining his energy. Don’t expect it to work for a whole match, though. And let’s not forget the Royal Rumble mode. This time you’re on your own, trying to pin or throw out your opponents to be the last man standing. A nice feature of this mode is that when a man is pinned, another wrestler can jump on top the pile to aid the pinfall count-out! So the game’s entertaining, is there anything wrong with the game? Well, now, that would depend on what type of cabinet you played the game. Unfortunately, the most common form of this game was the upright 2 player cabinet, thankfully with working speakers and the volume turned up (the thumping bass background track and the slightly grating voice synthesis do need to be heard for maximum effect, especially as the in-game commentary talks about every single move you do… for example “Warrior… Gorilla Press!”). 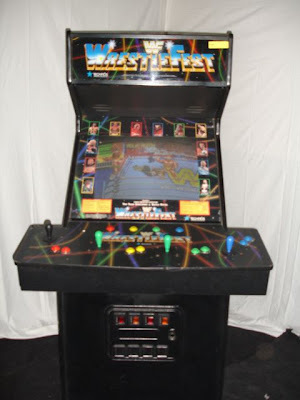 However, with some searching you may have been lucky enough to find the 4-player buy-in cabinet, similar to the Simpsons or Teenage Mutant Hero Turtles cabinets (or even Gauntlet) that were commonplace. 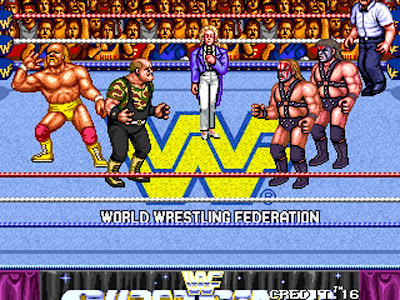 This meant you could have a proper 4-player Tag match or 4-players teaming up in a Royal Rumble, and really made the difference to the game. The ONLY real problem was the big, chunky graphics. Whilst stuffed full of detail and character, they did sometimes get a little confused, and with the view being so zoomed in, an opponent sent to the ropes often ran off-screen to return, or even caused the screen to scroll slightly annoyingly, and the problem can be more pronounced in multiplayer as the game tries to keep all players on screen at the same time… But that’s a minor gripe, the game wouldn’t have been the same without it. 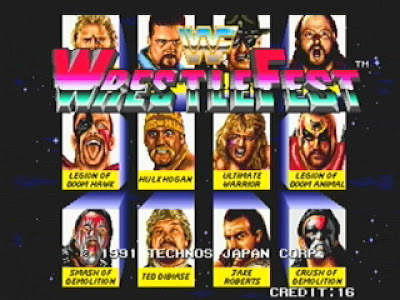 In summary, then, it’s one of the best executed wrestling games of all time, even down to the little things like the wrestlers looking tired and winded after a bit of punishment, there’s a steel cage match too. It’s well worth finding and playing, even if only through MAME. But if you’re really really lucky and you stumble across an original 4-player cabinet and you’ve a few friends in tow, that is certainly the best way to experience this game.